Presenting a spa and fitness centre, Sofitel Shanghai Hyland offers accommodation centrally located in Shanghai’s commercial district. 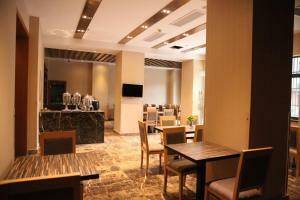 It features a business centre, 4 dining options and free private parking. 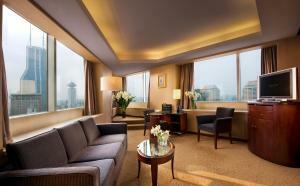 Situated along popular Nanjing Road, Sofitel Hyland is less than 0.6 miles from the historic Bund and Shanghai Museum. It is 12.4 miles from Hongqiao International Airport. 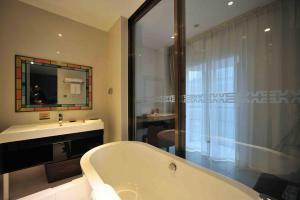 Elegantly decorated with wooden furnishings, the air-conditioned rooms enjoy beautiful views of Shanghai's cityscape. Aside from a pillow menu, each room also has a cable TV and electronic safe. Private bathrooms have toiletries and a hairdryer. The hotel's spa features relaxing massages and steam baths, while a well-equipped fitness centre is available for workouts. Car hire and airport transfer services can be arranged at the 24-hour front desk. Dining options at Sofitel Shanghai Hyland include Mao Chinese Restaurant and Mosaic Coffee Shop, which offers an international buffet. Light refreshments are available at the Sofitel Club Lounge and Bar 505. 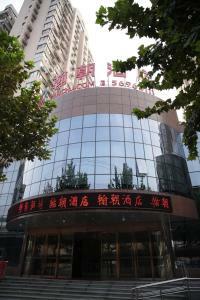 Kingtown Riverside Hotel Plaza Shanghai is located in Shanghai’s business, entertainment and shopping area. 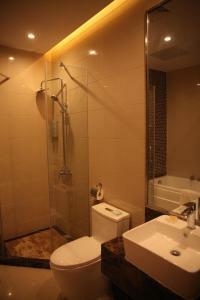 A 2-minute walk from Xinzha Road Subway Station Line 1, it offers free parking and rooms with free internet. Kingtown Riverside Hotel Plaza Shanghai is a short 550 yards from People’s Square, the Shanghai Museum and Nanjing Road Pedestrian Street. It is 28 miles from Shanghai Pudong International Airport. Shanghai Disneyland is a 46-drive journey away. Shanghai Hongqiao International Airport can be reached in 19 minutes by car. Guestrooms at Kingtown Riverside offer a stylish interior with modern furnishings. Each well-appointed room is equipped with a minibar, a work desk and a flat-screen TV with satellite channels. Shanghai Kingtown Riverside offers laundry and dry cleaning services. Luggage storage is available at the 24-hour front desk. Car hire and ticketing services are also available. 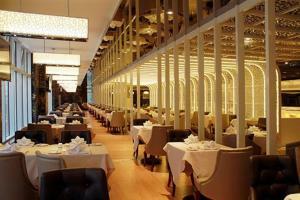 The hotel’s restaurant offers a wide selection of food, including Western and Chinese dishes. Drinks can be enjoyed at the coffee lounge. Located a 10-minute drive by car from the city centre, Holiday Inn Shanghai Vista offers rooms with 24-hour room service. It features an indoor pool, fitness centre, 2 restaurants and a lounge. Changshou Road metro station and Wuning Road metro station on lines 7&13 are within walking distances. The Temple of the Jade Buddha is within walking distance of the hotel. 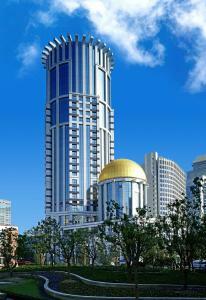 West Nanjing Road and Zhongshan Park commercial areas are within 10 minutes by car. 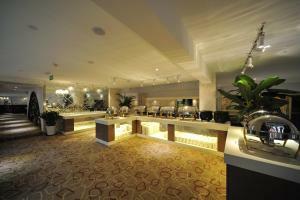 Holiday Inn Shanghai Vista is a 50-minute drive from Pudong International Airport. Each room at the Holiday Inn Shanghai Vista has a TV with satellite channels, minibar, air conditioning and bathroom with rain shower. Guests can enjoy views of the city from the rooftop fitness centre and indoor pool. Wellness facilities include a sauna and massage pool. 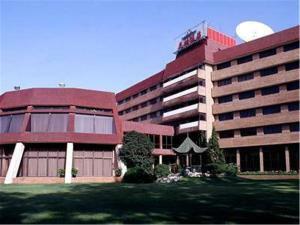 A well equipped business centre and banquet space are available. Wenxuan Chinese Restaurant offers a selection of Huizhou cuisines and local dishes, while Lingge Café serves Western and Asian specialties, buffet breakfast, à la carte lunch and dinner, and special hot pot for dinner. 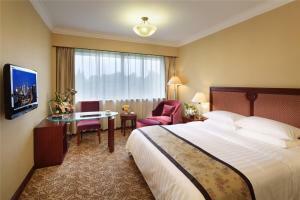 Shanghai Hanchao Hotel is located in Hongkou District, only a 3-minute walk from shopping centre like Hongkou Plaza. Scenic spots like Hongkou Toronto Celebrity Culture Street and Lu Xun Park are only a 10-minute walk away. Free WiFi access is available. Each guestroom is fitted with a flat-screen cable TV, a desk and air conditioning. The private bathroom comes with a hairdryer, slippers and free toiletries. It takes 35 minutes by car to Hongqiao Airport and 40 minutes by car to Pudong Interantional Airport. Hongkou Football Stadium Subway Station (Line 3, Line 8) is only a 8-minute walk away. Extra facilities offered at the property include a shared lounge, daily maid service and luggage storage. Guests can arrange trips at a tour desk while car rental service is available. Chinese-style breakfast is offered daily at the on-site cafe. Set within 1.4 miles of Shanghai New International Expo Centre and 2.6 miles of Shanghai Dongjiadu Ferry Station, LuJiaZui Supreme Tower provides rooms in Shanghai. Among the facilities of this property are a restaurant, a 24-hour front desk and room service, along with free WiFi. 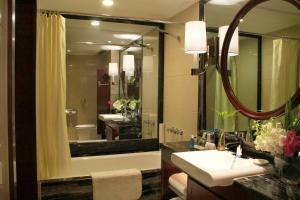 Situated in the Pudong district, the hotel is within 3.1 miles of Shanghai Dongchanglu Ferry Station. All guest rooms in the hotel are equipped with a flat-screen TV. Every room has a private bathroom. The property has a fitness centre. Shanghai World Financial Centre SWFC is 3.1 miles from LuJiaZui Supreme Tower. The nearest airport is Shanghai Hongqiao International Airport, 12.4 miles from the accommodation. 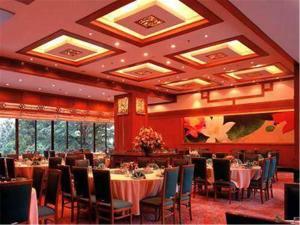 Cypress Hotel Jin Jiang is located in Shanghai, within 9.3 miles from the famous Bund, People’s Square and Shanghai Museum. It offers an indoor heated pool and free parking. 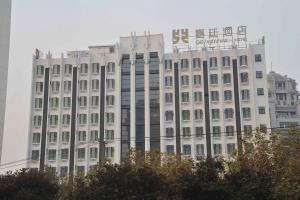 The hotel is 1.2 miles from Hongqiao International Airport. Pudong Airport is 31.1 miles away while Shanghai Railway Station is 9.3 miles away. Surrounded by 40 acres of greenery, all rooms at Jin Jiang Cypress feature Oriental décor. Amenities include free bottled water, a cable/satellite TV and minibar. Guests can enjoy relaxing massage services or maintain daily workouts at the fitness centre. Evenings can be spent at the games room or around the billiards table. Dining options at Cypress include German, Chinese and regional dishes. Fantastic views, freshly brewed coffee and light meals can be enjoyed at Sakura Bar. Central Hotel Shanghai is a 9-minute walk from People's Square Metro Station, a 3-minute walk from Nanjing Road and a 10-minute drive from the famous Bund. It offers 3 dining options, a fitness centre and rooms with free wired internet. 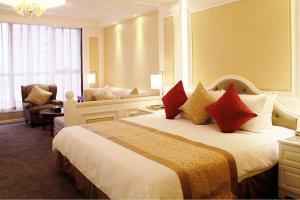 Hotel Central Shanghai is a 15-minute drive from Yu Garden and Shanghai Xin Tian Di. People's Square can be reached on foot within 10 minutes. It is a 20-minute drive from Hongqiao Airport and a 45-minute drive from Shanghai Pudong International Airport. Central Hotel Shanghai is a 43-minute drive to Shanghai Disneyland. Featuring modern interiors, air-conditioned guest rooms are fitted with a personal safe, an iPod dock and a flat-screen TV with cable channels. The en suite bathroom comes with toiletries and a hairdryer. Guests can request for a massage service, or unwind in the sauna room. Indoor Golf and billiards can be played. The staff at the tour desk can assist with making travel arrangements. Laundry and dry cleaning services are offered. The on-site Shanghai Restaurant features sumptuous, traditional Shanghai cuisine, crab dishes and Huai Yang flavours in an refined and classical atmosphere. A 7-minute walk from Pudong Avenue Subway Station (line 4), Novotel Atlantis offers accommodation overlooking Shanghai’s city skyline. It features an indoor pool and 4 dining options. Free parking is available. Situated in Pudong’s city centre, Novotel Shanghai Atlantis is a 20-minute drive from the Shanghai Exhibition Centre. Well-known Nanjing Road Pedestrian Street and the Bund waterfront are within a 15-minute drive from the hotel. It is a 45-minute drive from Pudong International Airport. 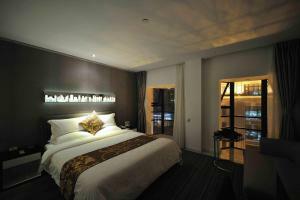 Modern rooms are located on high floors and feature panoramic city views. They are fitted with a safe and cable TV. Private bathrooms have a shower and toiletries. 24-hour room service is available. The hotel offers handy smartphones to staying guests with unlimited local and selected IDD calls and 4G internet access, as well as hotel’s information and a complete city guide to Shanghai. Guests can relax by the heated pool, which features floor-to-ceiling windows. A well-equipped fitness centre is available. The hotel also has a business centre for your convenience. 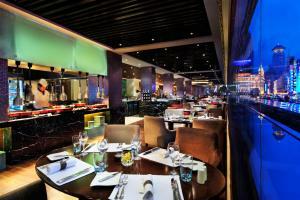 Dining options include Art 50, a rotating restaurant offering an international buffet. Chinese dishes are available at Golden Shark, while the 24-hour The Square Restaurant serves Brazilian barbecue buffet and a-la-carte service is available throughout the day. For simpler options, Le Gourmet Deli Shop offers fresh pastries, noodles and bento box. Takeaway is also available.